Frisch Fisch Kratschmer is an independent restaurant located in Neumarkt in der Oberpfalz, town centre. 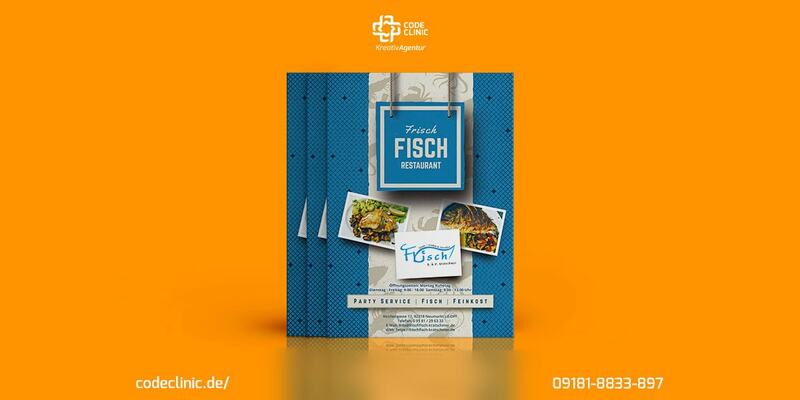 Owned and run by father and son Renè & Ossi Kratschmer, they offer a tasty menu of fish dishes year round both from their cosy restaurant and at many local festivals. Wishing to take advantage of new opportunities to expand their business reach and open new markets to increased profits, the Kratschmer family approached Code Clinic KreativAgentur. We were asked to create marketing materials specifically aimed at drawing in more lunchtime customers throughout the week. The target audience for this marketing goal was to be those working in offices and shops within 15minutes travel time of the restaurant. With this in mind Renè had been working on some basic concepts of ideas that he brought to us with a view to fully realising these goals. We established early on that to gain maximum benefit the goal would be for the flyers to be handed around places of work and passed between employees at break times and when making lunch purchasing decisions. Additionally, it would be important to create an attractive flyer that would hold a high potential for being posted to staff notice boards and suitable areas where employees congregate. With this in mind it was determined that the flyer needed to be not too big as to make this impracticable but also large enough to easily be noticed and read at a glance. 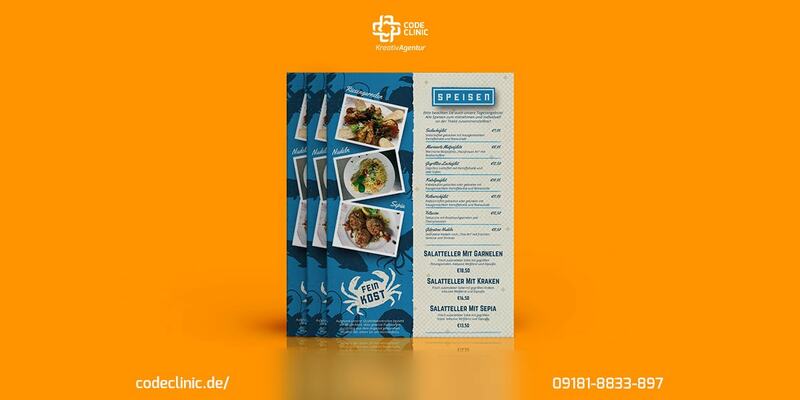 This resulted in our design team creating a modern and visually appealing design on a two sided Din a5 flyer, with a strong and clearly identifiable aquatic / fish / seafood theme. The Kratschmers were thrilled with the outstanding design and the high quality of the finished product which we also printed for them. The flyers have since been widely distributed and we are told that there has been a significant and clearly related increase in interest and paying customers since the campaign began.